Wonderfully written article. Exactly what we are trying to get right at our company. I guess the first step is realizing you have a problem. We are keeping our eyes open and through all the excitement of RPA and AI, trying to have good discussion and planning to ensure that we are not creating more problems than what we are trying to solve. Exciting times though. Integrated automation is nothing but adding new features, connectors to extend the scope of automation. RPA products are now fighting a battle to be be the first to develop integrators for all sorts of applications that are part of a process. Be it Tableu for Analytics, Abby for OCR or Supervisor to control RPA. RPA was ground breaking and just like any other product, it requires new offerings to survive. What Workfusion, AA etc. have done is the standard now- support the ecosystem. The silver lining is such extension of offering will address the question of why not APIs? Piecemeal automation is rear and thoughtless. The ROI emphasise will never allow automation in pieces. Why would one spend £5K to automate a minute part? RDA is still valid for the cost and mandatory manual checks. RPA is not dead, it is evolving. Hi All, I am working as dot net developer, but I am planning to change RPA UIPATH, how is the future about RPA UIPATH. Excellent article , as rightly pointed out we at times get obsessed with technology and forget the people and process part . Relgo Networks, an innocuous company in India is a great example of integrated automation, with role based defined processes automated in an integrated environment and delivered to suit personal needs and specific requirements quickly and deployed in cloud. Excellent article. Points mentioned are absolutely correct and rightly mentioned, the power is in AND. The article makes sense. However, there are fundamental issues in the way technologies are adopted in enterprises. With the barrage of technology inflows, there is always the inclination to throw technology at problems and gain the first mover advantage. It is evident when we look at the technology adoption lifecycle of any recent ones, be it cloud/AI/Machine learning. Process and People lags technology adoption in enterprises. There has to be a paradigm shift in the way we consume technology. Plan more, Think more, Deliberate more and then execute rapidly. At some point, CTOs/CIOs have to resist the urge. Yes, any automation cannot work independently, need continuous train to improve results, means automation is goes well with .AND. rather than .OR. This is a good overview of the components of Intelligent Automation. The point that it is about systemic transformation is especially well-taken. Radical re-thinking of existing processes will drive the greatest benefits, while functional and financial constructs such as earned-value, phased initiatives will provide the foundation for the deep changes - and rewards - IA will provide. Reality check and much needed level setting for all the Automation & AI aficionados and experts! Business problems are not entirely solved by one stand-alone technology but by the right combination of technologies. Couldn't agree more! Well done. Great article on the usage of RPA by combining technology, process and people which are the three pillars and need to be handled cautiously while bringing any change management. Quality of change and it's acceptance will play a vital role in any change Management exercise. Absolutely an interesting article. Standalone technologies are no longer going to solve the problem. They should complement each other and it also open ways for new innovations. RPA is dead: Phil Fersht and his team at HFS Research are one of the analyst firms that seems to get it right, all the time! This great article declares that RPA - IMHO the over hyped simple answer not to change your way of working, but instead automating what was working 20/30 years ago - is dead. In summary, a more hollistic integrated automation platform is needed. Recommended article worth reading! "Robotic" was never ever a real thing in process automation. To all those who could not and still cannot define exactly what a process is, it perhaps meant something. Because by definition, a process is a series of linked activities that has a measurable customer outcome. Robotic would mean unintelligent repetition of tasks; not intelligently connected activities. Any process expert worth his/her salt would tell you that continuous reengineering at the level of Sub-Processes and their Activities is what would produce Process benefits and not just the mundane automation of Workflows at a Task / Transaction level. Because, intelligence is embedded in the Controls of the Process that is dictated by Governance, Risk & Compliance (GRC). In realtime, roles across the ecosystem should be able to provide Intelligent Engagement and Experience that is Intuitive; not predefined or hardcoded. Thank God, RPA is dead. But what is replacing it? Can we get to the bottom line of how Intelligence is defined, derived and distributed in realtime across devise, channel and mediums in a secure manner to herald the oncoming of a new life? Well written and completely spot on Phil. This is exactly what we have been working on with our customers at DXC. Trying to change the mindset of the organization and educate them that just throwing RPA at a problem does not create any sort of solution. RPA AND AI AND ANALYTICS AND MORE is really the key to unlock the true value of transformation. It's time to move into the future and it takes the right technology, the right strategy and the right partner to achieve a better future state. As you know Phil, I am in full agreement with your main concept and points here. And I think you will concur, I saw this on my radar when we first chatted many years back., Knowing that RPA / RDA was only ever going to reach scale if it was PART of something bigger. I saw this years ago and is why we sold OpenSpan to Pega, and focused on technology to make our advanced Deep Robotics (and now bundled) part of an industry recognized Digital Process Automation (Integrated Automated, OneOffice, Digital Ops or whatever it’s called) platform. I will go further. RPA + AI alone does very little because AI isn’t a thing. This is another myth (with some exceptions) thrown out by the RPA vendors to keep their big investors happy and now used as the excuse it’s why you could not scale. What exactly is AI to RPA? You quote Workfusion (AI) but that’s paper automation – just one part of the process that in itself is rapidly becoming digitized. There are so many different AI and Machine Learning technologies built for different purposes and many have had $billions invested to make them unique (using AWS AI for instance to find a cat in the middle of a pack of dogs isn’t going to help predict when a customer might churn or if an email can be automated without a human ever needing to be in the loop). However, the RPA vendors are throwing AI (bolt-ons) around as if it is something bigger and as if it’s going to suddenly transform or digitize a process with RPA. As you say though, there are many other technologies, people and processes (and IT and Biz alignment) that must all come together to solve the problem of 20/30/40 year old legacy. The whole concept of RPA (speed, ROI) is thrown out the window if, in order to use it, it costs as much as automating the process properly. In 2012 and for the last 7 years, RPA has told the world you don’t need any of this, RPA was supposed to be so easy, it’s plug and play. Yeah, right. We shall see how this pans out but I absolutely think our go-to-market with DPA (Digital Process Automation), which includes RPA, RDA, AI, ML, no-code, Case Management, Rules engines + about 15 other core technologies, fully “integrated”, is the future. Rather than band-aids, DPA is changing the way the world builds software so you never need band-aids in the future. I think it’s real. Platforms are poor substitutes for well thought out products - ‘enterprise IT history’ is replete with platforms falling by the wayside. Fact is that despite all manner of marketing hype notwithstanding, there remains an important automation problem to be solved and the current crop of products and services vendors are still unable to get meaningful and complete products to customers. I love this piece Phil. We believe #RPA can do a lot of good things but needs to be part of a bigger picture if aimed for scale. Well, this article is quite obvious behind the tl;dr. In my RPA practice we do not even call RPA without ML a true RPA. Any Senior-level engineer is obliged to have ML experience. So it is mostly about how you call it, not what it is. In some decade of the 19X0s, we said that we needed to straighten the winding cowpath, not just pave it over so we can drive faster. We failed! RPA is dead. Long live IAP. RPA is evolving fast in conjunction with Machine Learning and AI. RPA has to be looked at as part of an overall plan. It will be an enabler in near future. This is really good analysis of RPA vs Integrated Automation. There is no doubt that without people and process transformation technology alone cannot reap in desired outcome and ROI. Of course, RPA, AI and Analytics together result in real benefit but it also require organizations to build their MODEL correctly which will tell as to how their ACTIONS impact the GOALS. An integration of Process owners, Policy Makers and Technology team in any organization. Most importantly, patience and readiness to give away legacy systems. Things will not change overnight for true transformation. Finally, RPA+AI+Analytics will not need companies for survival. Companies need RPA+AI+Analytics for their Survival. First of all RPA is by not dead by any measures as suggested by the clickbait title, I can assure that consultancies will make good money on this basic concept in the foreseeable future. There’s seem to be a strong need from a corporate community to gather around vague ideas that provides it with hope and vision for the future, without really articulating what’s the underlying substance. It’s no brainer that business is evolving towards integrated solutions, it’s been discussed years now, the problem is, like with many other concepts, it’s easier said than done. Vision for having RPA/ML/AI is nice but it’s not something you can deliver in near future in a standardized manner if systems providers are not involved or even responsible for solutions. As of today enterprise AI is a buzzword, ML space is hugely fragmented and from business standpoint these solutions simply don’t deliver any substantial benefits in a recurring manner. It is Sire.. The Baby is an adult coming into the uninsulated world of Automation where every product can transform the business and I hear you Phil Fersht and I hope everyone else acts upon the fact that you’re research depicts (the bigger circle of tech in comparison to people and process). The new adult RPA called “RTS” along with other college mates would still need to understand and learn the values of life that you’ve called out as ‘OneOffice’. Love it. @Thomas Kielman - clickbait is only there for people like you who clearly only scan headlines and spout off. We re-badge RPA as Robotic Transformation Software because that’s what it is (or what aspires to be). Only a small portion of it is actually “process automation”... most of it is desktop apps and screen scrapes. READ THE PIECE, DON'T JUST SCAN THE HEADLINE! Something that the leaders I have worked with have always envisioned and what I have preached to customers. Certainly glad to hear that from HfS! Top post. Thanks for the "AI is not a thing". Even though I work for a vendor using (and touting) AI, I get tired of the misuse and misappropriation of the term. The focus on technology vs. transformation is disheartening with too many companies declaring victory after “go-live” and losing the plot around realizing value and the heavy lifting of change management. I’ve also seen company after company going forth and buying 50 to 100 licenses of a software tool without any idea how or where to deploy it. Changing the mental model to focus on an integrated platform may help move the focus away from the tech and towards all the elements needed to achieve transformation. This is the beginning of the decline of hype....my only two cents is that soon we will see the acquisition of RPA companies by large software companies so as to embed RPA in their core software. RPA is basically just a glorified AutoHotKey/AutoIT/whatever wrapped into a marketing bs and friendly looking IDE on top. Unattended automation is almost always better off without RPA, for RDA scripting is good enough. Loved reading the article. All this while we have been hearing of the Triple A Trifecta being the future of automation. With ML & Analytics coming to the fore and being deployed as pilots across, along with Automation, it really paves the path for better outcomes from Intelligent automation than just automation. 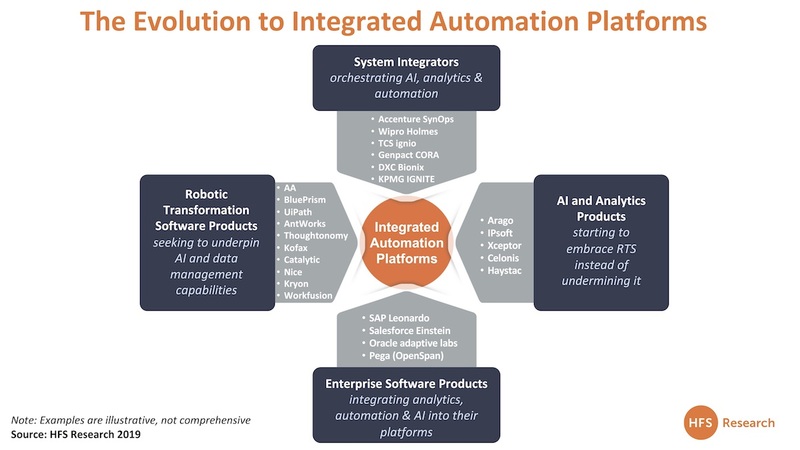 The graphic on integrated automation platforms is just so true, we can see the convergence and adoption across.